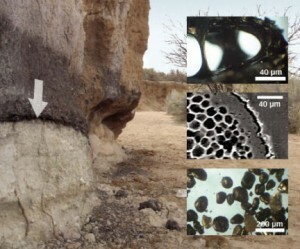 Some of the evidence for the recent hypothesis of an extraterrestrial impact that caused late Pleistocene megafaunal extinctions [Firestone et al. (2007) Proc Natl Acad Sci USA 104:16016–16021] was based upon samples collected at Murray Springs, a Clovis archaeological site in southeastern Arizona. Here we describe sampling and analyses of magnetic separates from within, above, and below the lower Younger Dryas boundary (LYDB) black mat at Murray Springs, as well as radiation measurements from the LYDB at Murray Springs and two other well-stratified Clovis sites. The main magnetic fraction at Murray Springs is maghemite. Magnetic microspherules have terrestrial origins but also occur as cosmic dust particles. We failed to find iridium or radiation anomalies. The evidence for massive biomass burning at Murray Springs is addressed and found to be lacking. We could not substantiate some of the claims by Firestone and others, but our findings do not preclude a terminal Pleistocene cosmic event.